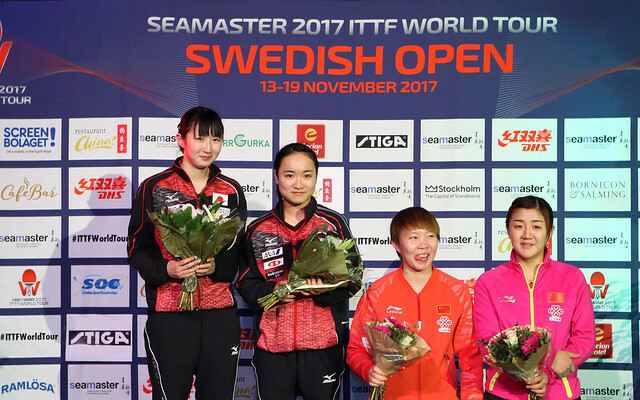 Ready for the challenge, highly motivated, against the odds, Japan’s Hina Hayata and Mima Ito won the Women’s Doubles title at the Seamaster 2017 ITTF World Tour Swedish Open in Stockholm on the afternoon of Sunday 19th November. The no.2 seeds, at the final hurdle they beat China's Chen Meng and Zhu Yuling, the reigning Asian champions and silver medallists earlier in the year at the Liebherr 2017 World Championships in Düsseldorf; impressively the Japanese duo won in four games (11-8, 1-11, 11-9, 11-9). Very much together, urging each other forward, Hina Hayata and Mima Ito secured the opening game; it was a wake-up call for Chen Meng and Zhu Yuling who dominated the second game. They won the first eight points, eventually surrendering just one meagre point. In the second game the Chinese duo was incisive, a few degrees extra rotation on the first top spin attack than was exerted in the opening game. Dominant in the second game, what would be the effect on the Japanese teenagers, both only 17 years of age, would they now succumb? Not so, they fought and, just as in the first game, they matched Chen Meng and Zhu Yuling blow for blow. Leading 9-8 in the third game Chen Meng and Zhu Yuling elected for “Time Out”. It proved not the best of decisions, Hina Hayata and Mima Ito won the next three points, they led by two games to one. Motivated, a sense of belief in the heart in the fourth game, the saw a chance, Hina Hayata and Mima Ito established an 8-4 lead, before at 9-7 ahead deciding a break was needed, they called “Time Out”. It proved a prudent move, at 10-8 they held match point. The first was saved not the second. The final point secured, Hina Hayata and Mima Ito celebrated. It is the second ITTF World Tour Women’s Doubles title that Hina Hayata and Mima Ito have won as a partnership; the one other occasion was earlier this year in the Czech Republic.